insect control – Grounds Services, Inc. I spotted a spider in the basement last night and it reminded me that spring is just around the corner, they must be getting as anxious for this winter weather to taper off as I am! For many years I have had a [very unfounded] fear of spiders, my fear has not been ‘cured’ by any stretch of the imagination, though I am getting better about tolerating some of them – not all of them, but SOME of them. With that being said, this article is about spiders and how to get rid of them. It’s important to note that they can live up to several months without a food source and some spiders have a lifespan of 20 years! In Ohio, our indoor spiders may live up to two+ years and it should be noted that we are fairly lucky in the lack of poisonous spiders. Black widows are found in Northwest Ohio & Southeast Michigan, they tend to build their webs and homes in debris, wood piles or other safe places that are seldom disturbed. The reason I point this particular spider out is that she is the most likely poisonous spider that may be encountered in our service area. When working outside or in storage areas, wear gloves to help protect your hands as you move things around. 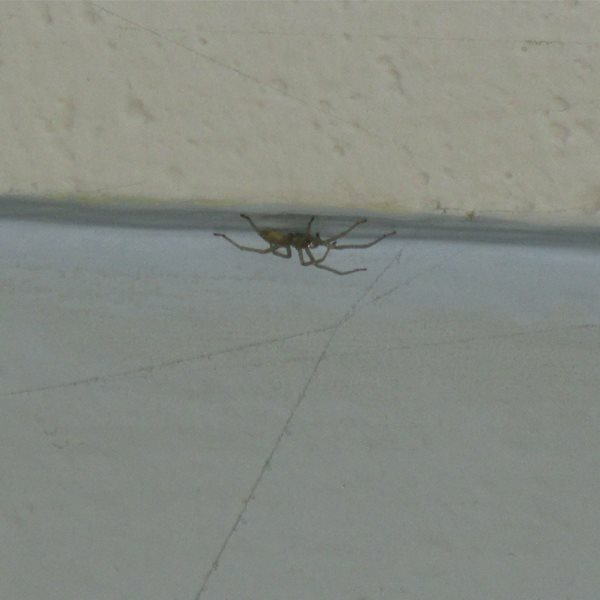 Another common culprit in NW Ohio / SE Michigan that may cause [sometimes serious] reactions from bites are yellow sac spiders (pictured above). These little guys are often found on flat surfaces and build ‘sac’ webs to hide out in. I have seen many of them in my house and they do have a heck of a bite that will leave behind a small (pin prick) lesion that will scab over. It may be painful and itchy – in most cases their bite does not need medical attention. They are nocturnal, aggressive and may bite multiple times. You may opt to simply whack them with a shoe or rolled up paper. Some sites recommend vacuuming them up, although this will work, it is important to note that they usually have a relatively long life span and can go some time without food, meaning they may escape the vacuum and return to your living areas. If you do vacuum them up, discard of the bag shortly after (if you have a bagless vacuum, make sure to wear gloves while empting the container. Take the debris to your garbage can immediately). Dish soap mixed with water and sprayed directly on the insect or in areas they frequent (leaving a residue) will help to break up their exoskeleton and dehydrate them to death. As a mother with young children, I have used this method many times with good results. Glue traps: these are sticky, flat surfaces that you can place about your home to help trap spiders and other insects. Place them in areas that are not often disturbed as this will be the common route most bugs will take. Destroying webs: this will deter spiders from continuously making their homes in some places. I have read, though have not tried, spraying white vinegar mixed with water will immediately kill spiders and other insects. Will try this soon and update. Insecticides: There are many on the market and a variety of active ingredients. We use a product with an active ingredient of Bifenthrin that has a relatively good residual. This product is labeled for both exterior and interior structures as well as lawn & ornamental. If spiders have become more than just a nuisance we do offer a bug shield to apply on the exterior or in your lawn.